Indication:- Hyperuricemia ( High level of uric acid) Swelling/ redness/pain in joint etc. Homoeopathic Dilutions are prepared under the supervision and guidance of exeprienced Homoeopathic doctors in the suictable and hygienic conditions, all homoeopathic dilutions are prepared from extra neutral alcohol as pescribed under Homoeopathic Pharmacopeia of India. 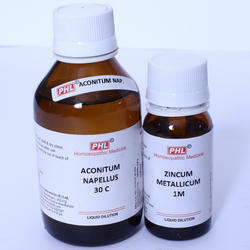 These medicines are available in all potencies in 30 ml and 100 ml glass packing at reasonable rates. Potentised medicines are called Dilutions. Dilutions are the core of homoeopathic treatment. The doctor's diagnosis, selection of medicine and the quality/purity of dilutions decide the success of homoeopathic treatment. 2. Back potencies are dynamised with exact measure of E.N.A., which is the purest form of alcohol unlike rectified Spirit. 3. 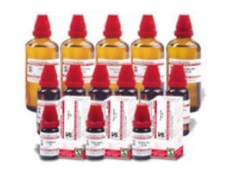 Indo German's dilutions are availbale in "6" potency to "1000" potency in different pack sizes like 30 ml, 100 ml respectively.